I work in an industry where “done” can sometimes have a very subjective definition. So one of the things that I really appreciate about working on mechanical things like motorcycles is that “done” is a very objective thing. As Matthew Crawford puts it in Shop Class as Soulcraft, a motorcycle “either runs or it doesn’t.” However, because I don’t have tons of time to devote to actually working on my motorcycle projects, being “done” with something is still a pretty rare and strangely alien occurrence. With the exception of The Mrs’ CM400, I’m not used to an old bike that doesn’t need something. Recently I finished a final round of work on my 1981 Honda CB750 Custom. That is, I completed all the work the bike seemed to need, and all the work I’d planned to do to it. The plan for this bike all along was to resurrect it from its years of storage atrophy, then either customize the hell out of it, or sell it as stock to finance other projects. In the end, I’ve opted for the latter. In theory, given all the work the bike received last autumn, I should have been able to summer-ize the CB750 this spring and put it straight on sale. However, the old Honda had other plans. I’d attempted to summer-ize it along with The Mrs’ CM400 on that lovely spring day when we both took our first ride together as Chicagoans. With fresh oil in its guts, a well-tended battery back in its side, and a tank full of stabilized fuel on its back, I pulled the choke all they way out and hit the starter. Three or four rotations of the engine later, it fired and ran. Quick attention to the throttle had the bike growling, if still a bit drowsy. 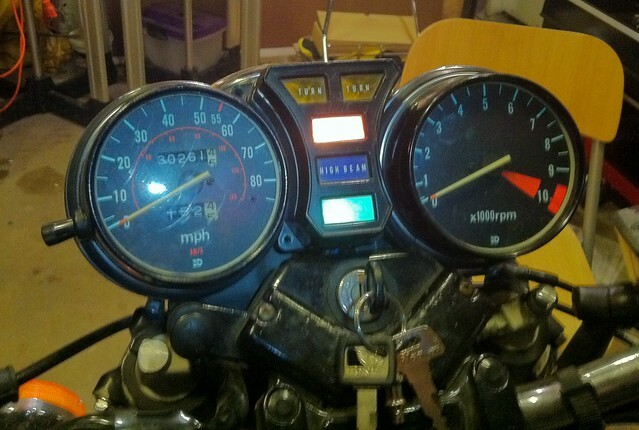 The idle was set too high though, so I reached under the carbs to turn the idle adjustment dial. That’s when I felt cold gasoline on my hand. I swore at the bike and grabbed a flashlight to confirm my near certainty as to why the carbs were dripping petrol. A quick peak, and sure enough, the fuel passages were leaking. I’d encountered this on the CM400 when we first got it. 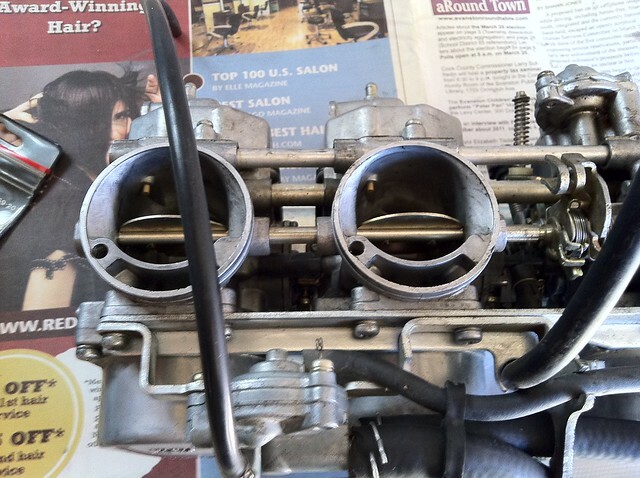 On newer motorcycles with multiple carburetors, there’s a single fitting where gasoline enters the “rack” of carbs and then a set of pipes share that fuel from one carb to the next. There’s then a second set of pipes that distribute fuel from the accelerator pump to nozzles in each carburetor. Each of these pipes has an o-ring on both ends to keep them sealed. Over time, the o-rings dry out and fuel will leak from the pipes. The motorcycle will usually run perfectly, but fuel will leak from the pipes — first as a weep, and eventually as a dripping piss of flammable liquid. It makes a mess too — steadily painting the aluminum engine casings orange. There was a certain satisfaction in knowing exactly what was wrong, but that didn’t dull the irritation of knowing what was ahead of me. I’d have to pull the rack, split the carbs, replace the o-rings. Then the rack would have to be reassembled, reinstalled, checked for air leaks and vacuum synchronized. At least for once I wasn’t staring into the unknown. I knew each procedure intimately. That was at least something. Even if I did have about six hours worth of work ahead of me, at least I knew what to do. I’d also take this opportunity to button up a couple of other things the CB750 needed before I put it up on sale. With that repair need, however, came a problem. I didn’t actually have anywhere to work. 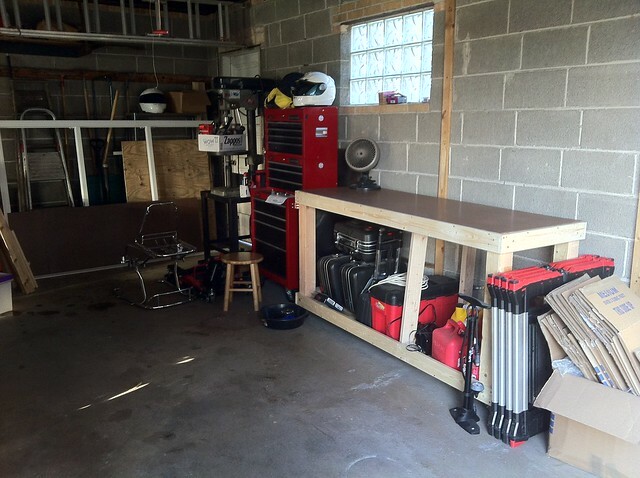 I had my new garage space set up to park bikes, and I even had my new tool cabinets set up, but I didn’t have a work bench yet. So before I could tear into the CB750, I needed to address my facilities. Most of all, I needed somewhere I could sit, break the carbs apart, and work without having to worry about losing parts or messing anything up. After a few weeks of planning and sketching, I had my workbench planned. I designed something that could be assembled from materials cut for me at Home Depot so that I’d only have to trim a thing or two at home. I also designed it to be lightweight, extremely sturdy, and on casters for easy moving around the garage. All the planning paid off big. I was able to go from zero to workbench in about four hours of assembly time. I didn’t skimp on materials either, as I wanted to build something substantial — something that unlike my previous workbenches, would go with me next time we move. 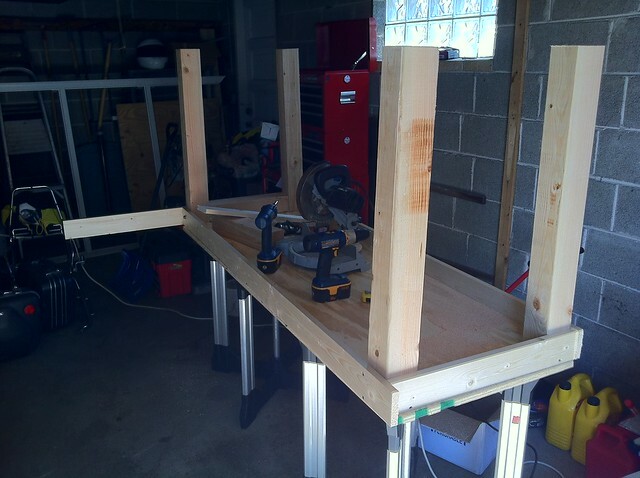 With about $160 of lumber and hardware invested, I now had a standing height, moveable workbench 6′ long and 2′ deep that’s sturdy enough to park a car on. It’s got 4×4 vertical members and the top and bottom are structural spans made of 3/4″ pine plywood and 1×4 sides. The top and bottom are almost i-beams, meaning the span is nice and sturdy. The finishing touch was a replaceable masonite top. The interior of the bench would later be divided up for shelving and storage, and in time, I’ll face its sides and put lockable doors on its front. Now for the motorcycle. Off came the seat, the tank, the cables and the clamps holding the carbs to the engine boots. With a bit of wrestling the rack came loose. Eight screws and four bolts later, I had four individual carburetors and some ugly-looking o-rings. There’s something especially irritating about a day’s worth of work being generated by less than $2 worth of old rubber. But hey, at least it’s serviceable. 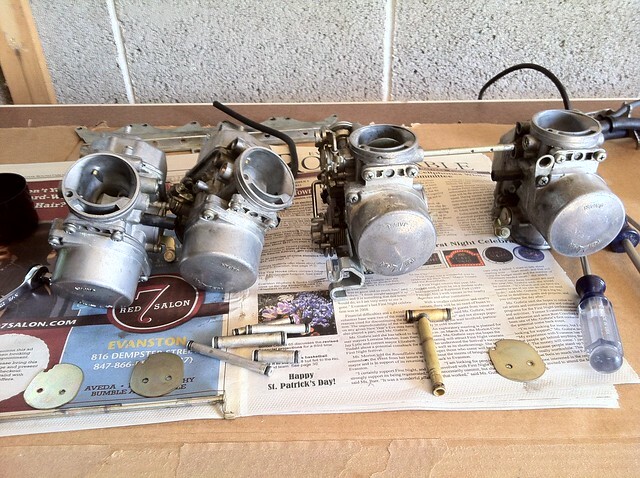 Getting a rack of four carbs off the bike and apart is relatively straightforward and easy. Putting the rack back together, on the other hand, is difficult. It isn’t complicated, it’s just tricky. 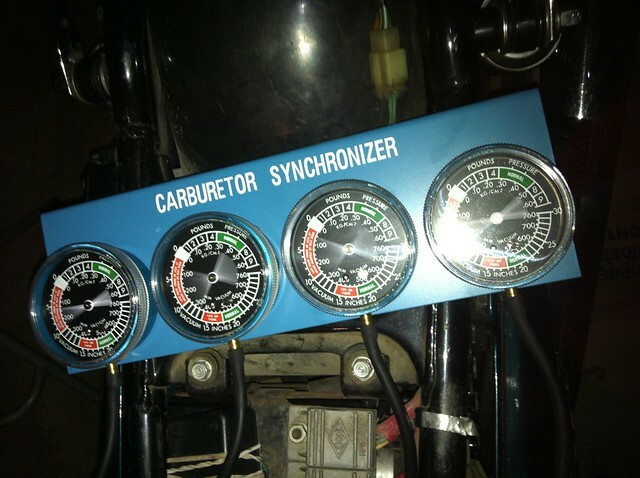 You’ve got to line up and reconnect the mechanism that links the throttle butterflies and choke butterflies — all while lining up the pair of fuel sharing pipes that run between each pair of carbs. If you had five tiny hands with seven fingers each, it’d be easy. But for a normal human, it takes a while to get everything in place and hooked back up. What took 30 minutes to take apart took me about two hours to reassemble. This meant lots of quality zen time in my newly established garage shop, and frankly, I enjoyed every minute of it. After a successful and leak-free bench test, the rack went back on the engine. My first attempt at tightening everything down left me with some air leaks around the boots, which is common on these inline fours. I had to loosen all the boot clamps and nudge the carbs all the way onto the engine-side boots. Then after tightening the living crap out of the boot clamps once more, it was time for a fresh leak check. The easiest, fastest way to do this is to run the engine, then spray each boot joint with some sort of flammable liquid such as carb cleaner, WD40 or starting fluid. If the engine surges, then you’ve got an air leak at the boot. This will mean lean running, which is hard on the engine and makes it run terrible. On attempt B, however, I had zero air leaks. Woohoo! It was time for a test ride. The bike ran a little rough, as the carbs weren’t quite sync’d yet, but it still ran pretty strong. The idle was all over the place, but that was to be expected since it was out of sync. The bigger problem I found, however, was that while riding, the bike would bog down really bad at 5,000 rpm and wouldn’t climb any higher. That might sound like a lot of revs, but on a CB750, that’s about half throttle and dead center in the engine’s power band. That wouldn’t do. It felt like the motor was starved for fuel. 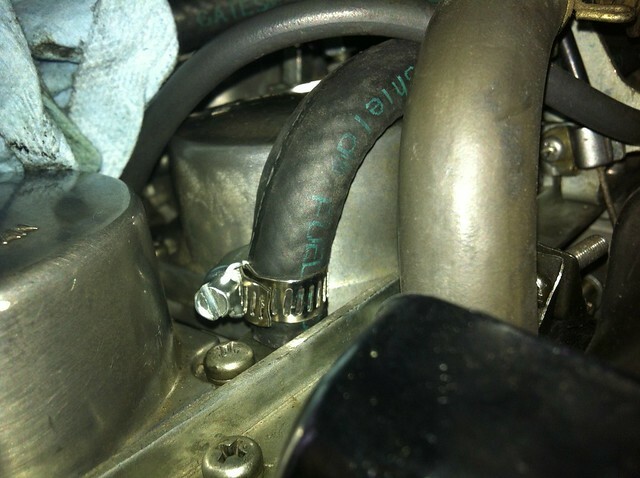 After some investigation, I found a kink in one of the fuel lines. It would need a longer line. Meanwhile, my new vacuum sync tool had arrived. Time to finish off this carb job once and for all! With a longer fuel line and all four vacuum needles bouncing in unison, my next test ride revealed a completely new bike. The motor was smooth, the throttle response was razor sharp and there wasn’t an instant’s hesitation in the engine all the way up near redline. Success. Only a couple things remained. I re-seated the headlight, and replaced a missing seat bolt. That left just the neutral light, which along with the oil pressure light hadn’t glowed the whole time I’d owned the bike. Electrical work used to be really intimidating, but thanks to successes with the GL and instruction from Jeff at BCM, I’m now a low-level Jedi with a multi-meter. Without a service manual to work from though, I had to follow the wires the old-fashioned way. I was finally able to find and extract the switch and test it. There was no change in continuity in the switch’s full mechanical range. I did, however, have full continuity in the wire running from the switch up to the lights, so that was a plus — at least I wouldn’t have to chase a broken wire up through the bowels of the bike’s wiring harness. Unfortunately though, I still hadn’t correctly diagnosed the issue. I ordered a replacement for the switch I thought was bad. It arrived and got installed, but I still had no green light in neutral. I rang up my old sansei, Jeff, who kindly walked me through the proper testing procedure. Turns out I was thinking about the neutral circuit backwards. Instead of a switch that completed the positive side of the circuit, this neutral switch completed the ground side of the circuit. So of course I had continuity through the wire to the light. This meant that my break was somewhere on the other side of the circuit — the positive side between the light and the battery. I opened up the headlight and started probing the connector with my multi-meter. Sure enough, there was a break in continuity somewhere between the light and the connector. At least it was in the short end of the harness. I carefully pulled that wire bundle apart and as expected, the neutral light circuit had a broken wire. A quick soldering and some heat shrink had it quickly sorted out. While I had the bundle open, I fixed two other broken wires — victims all of the bike’s lonely stagnation in that garage for so many years. The connections had corroded, but were now repaired. Much to my delight, a quick test at the key showed a dash full of lights. The bike was whole again. I was done. Everything I was going to do for this machine pre-sale had been accomplished. It was a strange feeling. I kind of didn’t know what to do next. It was satisfying and anti-climactic all at the same time. The next day I gave the bike a good polish and rode it up the street to take photos of it for Craigslist. There was something right in the spirit of the machine now. Something whole and energetic. 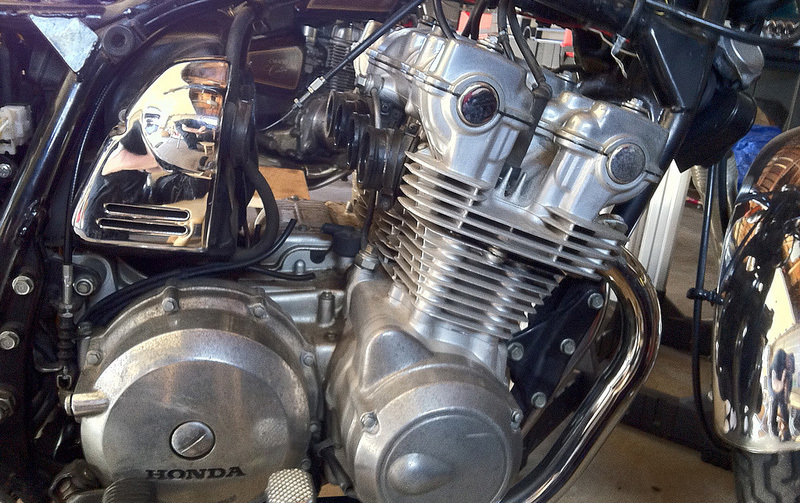 As the engine hummed along, I felt conflicted about the CB750 for the first time. The plan is for its sale to finance the next chapter in both the Ride and Wrench Logs. Maybe that’d be the Honda Elite 250 scooter I’ve been hunting for. Or maybe it’d be the modern motorcycle I keep threatening to buy because these older bikes have required so much work. It still felt weird though. Was I really going to sell this thing now that it was finally 100% healthy? In the end, that’s exactly what I did. Or at least, that’s what I’m trying to do. It’s still in progress. I took the photos and posted the machine to Craigslist. As of this writing, it’s been listed for ten days. I’ve even put a physical “for sale” sign on it and have been leaving it parked on our street. There’s been a steady trickle of interest, but nobody has pulled the trigger on it yet. It’ll go. I’m not actually worried about that. Meanwhile, I keep moving it to and from my ever improving garage shop — taking it for little spins around the neighborhood each time I do. On each of these rides, I experience the now healthy bike. With each little blast around the block, I get more and more accustomed to that feeling of finally being done with it. At first I thought this was a growing affection for the CB750 itself, but that’s not it. At least, that’s not all of it. What finishing the CB750 has done for me is given me a renewed perspective on old motorcycles in general. Just a couple weeks ago I had an unfinished CB750 and an electrical gremlin in the GL1100 that had it stone dead. That confluence of repair needs was giving me flashbacks to last season — where all I did was wrench on old bikes instead of ride them. That’s when the thought of a modern machine started feeling more and more certain. Meanwhile, a handful of days later, both bikes are completely fine. The GL even has new handlebars and control cables on it. Perhaps the lesson here is that I needed to experience being done for once. It’s been too long. 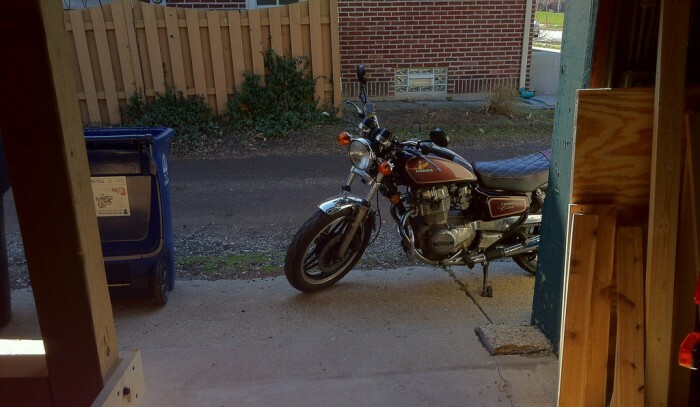 The CB750 is now finally where the CM400 has been for more than a year: trustworthy. This has me reevaluating my outlook on old motorcycles again. Maybe an all-vintage fleet really is feasible. For now I’m done with this machine, but I think I’m far from done with old bikes. That’s a good feeling.